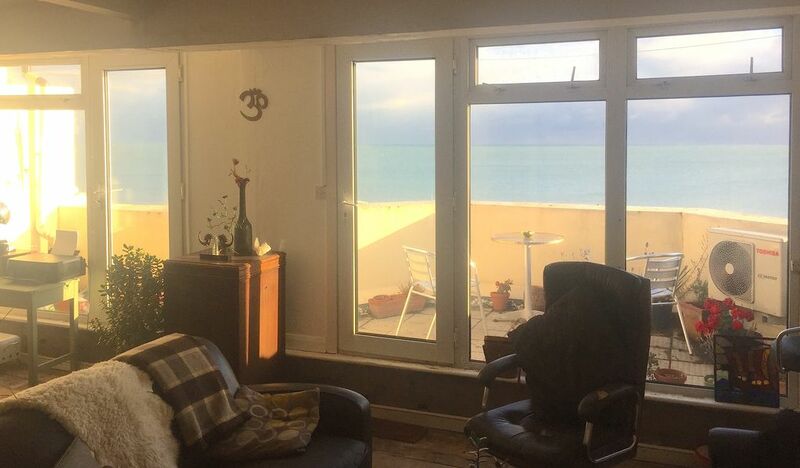 This recently renovated spacious and light-filled flat is on St Leonards seafront, close to the new pier, Warrior Square, Hastings, art and culture (eg the Jerwood gallery), many restaurants, the beach, and all sorts of other activities. It has amazing views from its roomy balcony, high ceilings and a great location. It's laid out in shabby chic style, bare floorboards, rugs, open plan, etc. It's a very comfortable space and place to relax in. It is a really great place for couples and single guests to relax and enjoy a beautiful weekend by the sea. It's a very relaxing, quiet and beautiful place to stay. The view is the sea. That's all. It's amazing to look out at the changing colours and tides each day. Parking is free behind the flat - about a minute/two minute walk away. It's pay parking in front of the flat, £1/hour. We had a lovely weekend in Neil's flat, the balcony is wonderful for taking in the view of the sea and the bedroom is very quiet and comfortable with no noise from the front. The living area is nicely furnished with bare untreated floorboards and rugs and the sofas make the space feel very homely. We cooked in the little kitchen space which is perfectly functional but would benefit from a few finishing touches. The bathroom has a nice long bath and good electric shower. The shared entrance hall and stairs could do with some tlc but it becomes a little more homely at the top. Perfect for a weekend by the sea with a good walk into town along the front. A treasure of a flat with an absolutely stunning view from the balcony. Two minutes walk from St Leonards town centre (Warrior Square). Excellent location fronting the Hastings Promenade and the sea! Great peaceful 'perch' above the street noise and walkable to all sites in St. Leonard's and Hastings. Laid-back host and living quarters. A gem in the area!